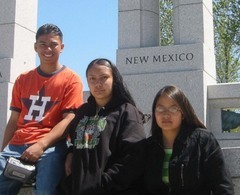 Indigenous Voices Media is a radio journalism program for young people living in under-resourced communities around the Navajo Nation in northwestern New Mexico. The program began in 2003 with the primary goal of increasing local teens' exposure to and participation in journalism. Participants learn the fundamentals of radio journalism, including development of story ideas, interviewing, scriptwriting, and use of digital editing software. They have produced pieces ranging from family oral histories about uranium mining and cultural preservation to a 20-minute feature about the challenges and aspirations of Native basketball players. Although training emphasizes journalistic best practices, students have autonomy over much of the content and structure of stories so that their individual voice and storytelling style come through in their work.